There's an amazing amount of interesting information about retro games that isn’t specifically tied to one console or game. These include series histories, retrospectives, publisher/developer overviews and just some fun, informative articles. Take a look through our archive and check back for new articles every so often. 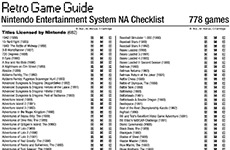 RGG checklists are platform based PDF files that list all games released in North America for the console. Download and print out the lists and use them to keep track of which games you own including their boxes and manuals. This Retro Reads article covers what fans are calling the Zelda Bible. Going into incredible detail on how the Zelda games are connected and showcasing a ton of great artwork, this book is a great addition to any fan's Legend of Zelda Collection. 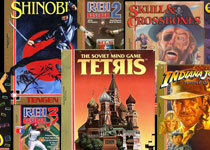 Tengen used every trick in the book to become the most recognized unlicensed developer on the NES. Their tale includes a surprising beginning and numerous lawsuits which make for one of the more interesting publisher stories in retro gaming. Check out our article on Tengen, its history and its fate. Check out our review of the Capcom 30th Anniversary Character Encyclopedia. A 208 page hardcover celebrating 30 years of Capcom characters released on Oct 21, 2013. There are a ton of amazing retro games that never made it over to North America for various reasons. Here are some import titles that you should know about. After Tim Schaffer proved crowd-funding was a viable option for video gaming with his project Double Fine Adventure, the Kickstarter flood gates were open for video game content. Check out the games that get a second chance for release on retro consoles after successful Kickstarter campaigns. Alex Kidd was the star of the Master System, with 5 games released on the platform bearing his name. The popularity of the character within Sega's fairly characterless portfolio caused him to be adopted as Sega's mascot for the late 80's. In the first part of our publisher series discover the history of one of the infamous video game publishers, LJN. These days, they are often criticised for the low quality of their games and the frustration these games have caused players. Because their games are all based on popular movie or comic franchises, they sold well, but were critically panned. What would it cost to collect every game for each retro platform. Follow along as we try to find out! Current articles include the NES, Nintendo Power, and the Master System. With the release of The Legend of Zelda: Skyward Sword this Sunday, it seemed like a good time to start an article on the Legend of Zelda series. This article will be a work in progress with more games continually added so check back every so often to see what's up. For now we're focusing on the first 3 games on the series.